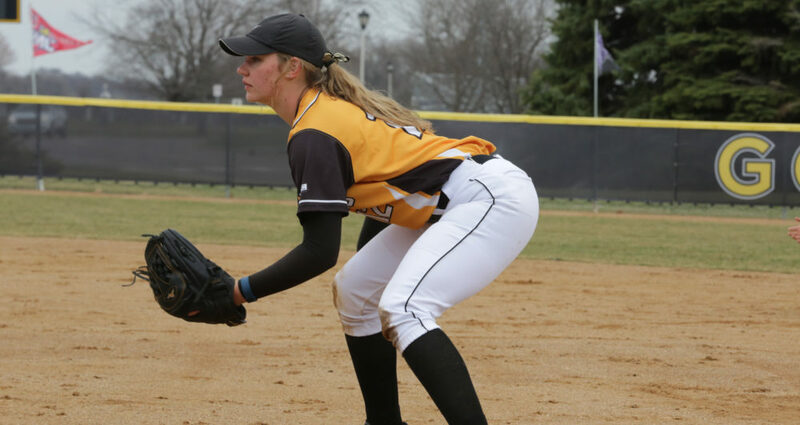 TUCSON, Ariz. – The Gustavus softball team dropped both games of a Sunday doubleheader against UW-La Crosse at the Tucson Invitational, moving to 3-9 overall. The Gusties lost 5-1 in game one and 10-1 in game two. As the visiting team on the scoreboard, the Gusties took a 1-0 lead in the first inning, but the Eagles answered in the bottom half and then scored a pair of runs in both the fourth and fifth frames. The lone Gustavus run was scored by Sidney Welp (So., St. Peter, Minn.) as she doubled and crossed home on an RBI groundout by Emily Webb (Jr., Maple Lake, Minn.). Ashley Neuenfeldt (Fy., Bloomington, Minn.) suffered the loss after three innings of work. She allowed two earned runs on four hits with three strikeouts and a walk. A two-run first and three-run second for UW-La Crosse set the tone in the convincing decision. For the second-straight game, the lone Gustie run came in the first inning. Neuenfeldt singled and later scored on a ground ball. The Eagles added five runs in the sixth inning on just one hit and four errors. Neuenfeldt led the Gusties at the dish, batting 2-for-3 with a run. She also took the mound loss, lasting one and two-thirds innings with five earned runs on seven hits. Gustavus wraps up play at the Tucson Invite on Monday with a double header against Buena Vista.